Scrap metal collection is a critical job, and metal scrappers provide this vital role. We are surrounded by metal products in our everyday lives. Eventually, scrap metal is no longer useful and is removed from use. The scrap metal collector, as the frontline participant in the scrap supply chain, is a supplier to scrap dealers. Scrappers perform an indispensable service in ensuring that end-of-life metal is collected and diverted into the recycling stream for reuse. Step 1 Learn to recognize various types of scrap metal, including ferrous and nonferrous metals. Nonferrous metals include copper, aluminum, stainless steel, and others. Ferrous metals include iron and are typically found in such products as obsolete machinery, stoves, refrigerators, and automobile engines. Nonferrous metals typically include metals such as copper, brass, aluminum, magnesium, and alloys. Typical scrap objects and materials include copper wire and piping, brass fixtures, aluminum siding, and chairs, old computers, etc. #1 Copper is 99% copper by weight and free of any brass attachments or paint (think clean copper pipe), whereas #2 Copper is 96% or more copper by weight. Step 2 Get acquainted with local scrap yards and their personnel and understand the pros and cons of various scrap dealers. Scrap operations can be looked up in the Yellow Pages or through an Internet search. By building relationships with local dealers, you will get a better understanding of material grades and identification, pricing and other opportunities. The closest dealer may not be your best bet. Some dealers, for example, may not deal with entry-level collectors, or may only take certain types of metals. There are other considerations such as price paid, and whether payment is by cash or check. Step 3 Understand how scrap metal pricing works. Generally speaking, nonferrous metals are more scarce and more valuable than ferrous metals, but there are many different considerations. Because pricing can fluctuate with daily marketplace activities, you may wish to keep current on pricing trends. One way to keep current is to subscribe to publications such as American Metals Market and Metalprices.com. The separated material is more valuable. Sort into separate containers. One useful tool is iScrapApp.The iScrap App is a leading app which offers a digital directory that can connect scrap collectors with scrap yards across the United States and Canada. It provides recycling tips and best practices, as well as frequent scrap metal price trend information on its blog. Step 4 Choose a vehicle for scrap collecting. Beginning scrap collectors need a pickup truck or a utility trailer for collecting scrap, as well as tie down straps or cargo nets to secure the load. As your business grows you may wish to consider a 3/4 ton or larger pickup and an 18' utility trailer with a winch. The use of separate buckets or containers for different types of metals can help minimize extra handling of material. Ramps or hoists can help remove some of the physical effort required for metal collecting. Step 5 Plan for a safe operation. Ensure you have the necessary personal protective equipment and understand how to use it, as well as how to safely operate tools. Safety glasses, gloves, safety shoes, reflective vest and first aid kit are basic elements of safe collecting. Hearing protection and a welding mask may also be required. Keep alert to moving traffic and equipment. Also be mindful of potentially harmful substances that may be stored in scrap, such as gasoline in old vehicles, refrigerants in old air conditioning unit, or toxic substances in containers. Visit OSHA for a more comprehensive discussion of scrap metal safety. Step 6 Gather some basic tools of the scrap collecting trade, including a magnet, which helps identify ferrous metal and a grinding wheel, which can help identify metal type by what kind of spark it produces. Additional equipment can include various hammers, screwdrivers, wire cutters, pocket knife, drills, pliers and pry bars. Step 7 Determine where your best opportunities are for finding scrap, and develop collection routes. This may include small businesses, auto repair shops, demolition sites, plumbing businesses, and so on, as well as residential collection. If you find businesses that regularly generate scrap, you may wish to create a route that would include periodic pickup. It may be worth your while to arrange to drop a bin at a business to accumulate scrap. Other approaches include local advertising for scrap pickup or attending garage sales, for example, to look for old brass lamps or other metal items. Starting Tip One consideration to be mindful of is material theft. Do not remove scrap metal from private property without approval of the owner. 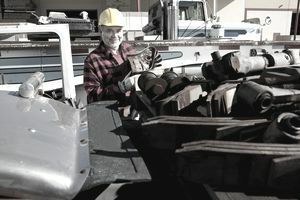 Additionally, depending on the jurisdiction where you operate, such as in Oregon, there may be specific scrap collection regulations, and many scrap metal dealers follow the ScrapTheftAlert program. Where such initiatives exist, you may require special licensing, or the scrap metal dealer may be required to photocopy your driver's license and pay by check. Be sure to check the local requirements for your state.